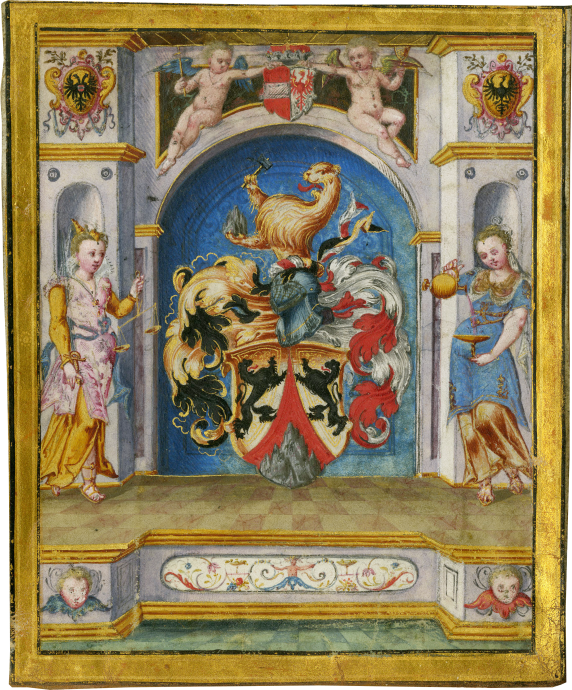 This charming illuminated heraldic device was probably created as a frontispiece to a book made for an Austrian noble. The unidentified coat of arms is composed of two rampant lions sable with a craggy mountain at center, surmounted by a lion or with hammer. This charming illuminated heraldic device was probably created as a frontispiece to a book made for an Austrian noble. The unidentified coat of arms is composed of two rampant lions sable with a craggy mountain at center, surmounted by a lion or with hammer. The device is flanked by personifications of Justice (left) and Temperance (right) standing before empty niches on a raised platform with a neoclassical frieze. Above a rounded arch are two winged putti supporting the arms of the Archduke of Austria. The leaf is finished to a remarkably high degree, with shading and delicate washes of color. The neoclassical elements, rosy-cheeked figures, and washes of color are all comparable to the work of Sigmund Elsässer (d. 1587), court painter to Archduke Ferdinand II. Elsässer is best known for illustrating the Festival Book of Ferdinand II in 1580. The figurehead of the court of the Bavarian Circle of the Holy Roman Empire under the Habsburgs, Ferdinand II is famous as an art collector and patron, particularly for the art and curiosities at Ambras Castle in Innsbruck. The parchment leaf is mounted to a paperboard support, obscuring the reverse. The miniature is in good condition, with small areas of loss and some rubbing to the gold leaf. Unpublished, but to the Festival Book of Ferdinand II, Vienna, Kunsthistorisches Museum, inv. no. 5269.